The world anxiously awaits the decision from the Eurozone on how they will handle the Greek meltdown. Will there be a bail out, or not? One aspect of the Greece situation that is being closely monitored is the confidence of the average Greek citizen of their savings at the banks. If they begin to feel that the government will not be able to avoid default and they realize the implications that will have on the availability of their deposits, it could trigger a bank run. That scenario would be a large determinant on the speed of a bail out if one should occur. The Greek debt crisis is fascinating to watch in that it is a small microcosm of the global financial world; one that is based on debt and confidence. When investors lose confidence in a creditor's ability to pay, the money flows away from that source with breathtaking speed. As the euro has lost significant value against the dollar over the past few weeks, I continue to hear how this current crisis shows the "strength of our currency relative to other nations." This notion is laughable at best. 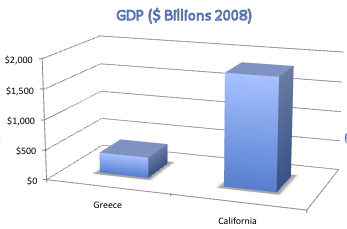 The following chart shows the size of the Greek economy relative to the size of the Californian economy. What most people do not understand is that California is in FAR worse fiscal shape than Greece. They are estimated to have at least a $25 billion budget shortfall this year and that mushrooms in size as we move forward. While California is the largest problem by far, states all across the country are moving closer to insolvency. In December 2009, Bloomberg estimated the state budget shortfalls at $300 to $500 billion by 2011. We are one large country made up of small Greece like states. What has kept these problems off the surface? Last year a significant portion of Obama's $800 billion stimulus bill ($200 billion) went to "stimulate" states. States have used this money to cover their budget deficit shortfalls, which has masked the problems thus far. This money is estimated to run out during the fourth quarter of this year. This is just the state level debt. 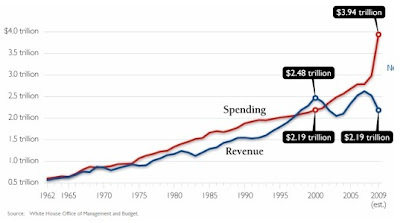 The following chart shows the relation of revenue to spending for the Federal government since 1962. Last year we began on a frightening path. 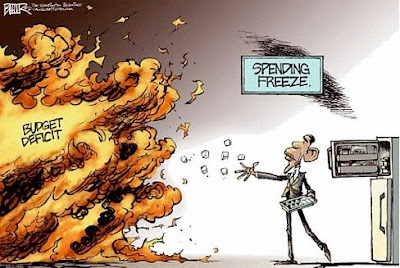 In the State of the Union address this past Wednesday, Obama has proposed a spending freeze in small areas of government spending. I view this as throwing a few ice cubes at a forest fire. I anticipate a bail out coming for Greece of some sort. This will shake up the confidence of the Euro in the short term and perhaps even bring another short term rally into the dollar. Ultimately though, all the currencies are part of one large insolvent financial system and even though some will gain strength against others as we move forward through the turmoil; they are all losing value simultaneously. Think of it like ships sinking in the sea. Some are sinking faster than others. The true value of the ships will be seen in the price of Gold, which can be thought of as the sea level as the ships are sinking. Enjoy the current pull back in Gold, and keep adding to your positions. If the European Central Bank decides that printing money to bail out the sovereign debt is the best option, it takes the ultimate Gold price target to the 5 digits.